Brandon Dawayne Roy (born July 23, 1984) is an American retired professional basketball player who played for the Portland Trail Blazers and Minnesota Timberwolves in the National Basketball Association (NBA). He was selected sixth in the 2006 NBA draft, having completed four years playing for the Washington Huskies. His nickname was "B-Roy", but he was also referred to as "The Natural" by Trail Blazers announcer Brian Wheeler. On December 10, 2011, Roy announced his retirement from basketball due to a degenerative knee condition, though he returned in 2012 to play five games for the Timberwolves. Born in Seattle, Roy became known for his immediate impact on the Trail Blazers. Zach Randolph, then the team captain, was traded to the New York Knicks at the end of Roy's first season in 2006–07, which cleared the way for Roy to take on a leadership role on the team. That season, Roy won the NBA Rookie of the Year Award in a near-unanimous vote. He was selected as a reserve to the 2008, 2009, and 2010 All-Star games. Roy played the most minutes of any Western Conference player, and tied for the most points in the West in the 2008 season, and he played the most minutes of any player during the 2009 season. Roy attended the African-American Academy elementary school. He first started taking basketball seriously while playing for the Amateur Athletic Union, one of the largest sports organizations in the United States. He attended Garfield High School in Seattle, and was considered one of the state's best high school players. He was an early-entry candidate for the 2002 NBA draft straight out of high school, but he withdrew his name after consideration. Roy attended Nate McMillan's basketball camp in the 1990s when the future Blazer coach was still playing for the Seattle SuperSonics. Considered a four-star recruit by Scout.com, Roy was listed as the No. 6 shooting guard and the No. 36 player in the nation in 2002. Roy faced challenges before entering college. His parents and his older brother had not attended college, and due to a learning disability Roy had difficulty with the SAT; his reading comprehension was slow, which increased the time he needed for tests. He had taken the test four times (with tutors) before finally meeting the NCAA requirements. Unsure whether he would be able to attend a four-year college, Roy worked on the Seattle docks, cleaning shipping containers for $11/hour. In 2002, Roy started to play for the University of Washington (UW). He remained there for four years under head coach Lorenzo Romar. He majored in American Ethnic Studies. After his junior year, Roy considered entering the draft, but changed his mind when he learned that teammate Nate Robinson and high school senior and UW signee Martell Webster intended to enter the draft. He saw an opportunity to rise in the ranks on his college team, and improve his draft position. On December 29, 2005, Roy led the Huskies to victory over the Arizona State Sun Devils with a college career-high 35 points and became the 31st Washington player to score 1,000 points in a career. The following game he equalled his career-high of 35 points in a double overtime loss to the Arizona Wildcats. During his senior year Roy averaged 20.2 points per game while leading the Huskies to a 26–7 season and a second straight Sweet Sixteen appearance. Roy was named Pac-10 player of the year and received All-American honors at the end of the season, while also being a finalist for the Wooden, Naismith, Oscar Robertson, and Adolph Rupp awards. Roy had a 2006 pre-draft workout with the Trail Blazers prior to being selected by the Minnesota Timberwolves as the sixth overall pick. However, he was immediately traded to the Trail Blazers for the draft rights of Randy Foye. On January 22, 2009, before a University of Washington Husky home game versus the USC Trojans, his number 3 uniform was retired. Roy's NBA debut was in his hometown against the Seattle SuperSonics. He scored 20 points in that game, and 19 in the following game. An impingement in his left heel kept him out of 20 games early in the season, but he scored his first career double-double shortly after his return, on December 22, 2006, against the Toronto Raptors. At the end of January 2007, Roy led all NBA rookies with 14.5 points per game. He became the fourth Trail Blazer to be selected for the rookie squad of the NBA All-Star Weekend Rookie Challenge since its inception in 1994. He was the first Trail Blazer to participate in the All-Star Weekend since Rasheed Wallace's selection as an all star reserve in 2001. He was the Western Conference's Rookie of the Month in January, February, and March 2007. After averaging 16.8 points, 4.4 rebounds and 4.0 assists per game during the 2006–07 NBA season, Roy was named NBA Rookie of the Year. He received 127 out of 128 first-place votes. Due to injury, he played in only 57 games in that season, the second-fewest games for a Rookie of the Year. He was the third Trail Blazer to win the award, the first two being Geoff Petrie and Sidney Wicks. Roy started in the first 48 games of the 2007–08 season, averaging 19.1 points, 5.8 assists and 4.6 rebounds. He also led the Blazers to a 13-game winning streak in the month of December. Roy was selected as a reserve for the 2008 NBA All-Star Game. He scored 18 points in that game, and also had 9 rebounds. He injured his right ankle in the final game before the All-Star Weekend. Although he earned accolades for his play over the weekend, the injury impacted his play in the following weeks. He played in the Rookie Challenge for the second time, this time as a "sophomore"; teammate LaMarcus Aldridge was also on the sophomore squad. Roy played about 29 minutes in the All-Star game, the most of any Western Conference player. He also tied Chris Paul and Amar'e Stoudemire for the most points with 18. In the 2008 preseason, Roy underwent a 20-minute medical procedure in Vancouver, Washington, during which team physician Don Roberts removed a piece of cartilage that was causing irritation in Roy's left knee. Roy missed several weeks of action because of the rehabilitation, but was ready on the opening day of the season against the Los Angeles Lakers. On November 6, against the Houston Rockets, Roy hit a game-winning 30-foot jumper in overtime with eight-tenths of a second left. On December 18, Roy scored a career-high 52 points against the Phoenix Suns. He made 14 of 27 shots from the field, 19 of 21 from the free-throw line, and 5 of 7 from the three-point line. He also added six assists, five rebounds and a blocked shot, all without a turnover. On January 24, Roy tied a Blazers franchise record with 10 steals against the Washington Wizards. On February 8 with the Blazers trailing by 1 against the Knicks, Roy made a layup at the buzzer to win it 109–108. As of February 16, 2009, Roy has had 24 shots which tied or won the games with 35 seconds or less. Roy was again selected as a reserve in the 2009 NBA All-Star Game, where he scored 14 points in 7-for-8 shooting, grabbed 5 boards, and dished out 5 assists in a game-high 31 minutes of action. On April 13, Roy was named Western Conference Player of the Week, the fourth time he has won the award. Roy and Clyde Drexler are the only Portland Trail Blazers to win the award four times. Roy finished 9th in MVP voting for the 2008–09 season, garnering one 4th-place vote and four 5th-place votes for a total of 7 points. Roy was named to the All-NBA Second Team on May 13, and was the first Blazer to make an All-NBA team since the 1991–92 season. On August 5, 2009, it was confirmed that Roy had agreed to a four-year maximum-salary contract with a fifth-year player option, keeping him a Trail Blazer until at least the 2013–14 season. Roy was selected to compete in the 2010 NBA All-Star Game, marking his third selection as an NBA All-Star. However, Roy was sidelined because of a right hamstring injury he sustained on January 13 against the Milwaukee Bucks, and re-aggravated on January 20 against the Philadelphia 76ers. On April 11, 2010, Roy injured his right knee. Magnetic resonance imaging that night confirmed a right knee bone contusion (bone bruise) and on April 12, further examination of the MRI showed a slight meniscus tear. Roy underwent surgery on April 16 and was expected to miss at least the first round of the 2010 NBA Playoffs, but returned for Game 4 after eight days of recovery time to lead the Blazers to a win. Roy was named to the All-NBA Third Team on May 6, and this was his second season in a row to be named to an All-NBA Team. Roy started the first month of the season scoring at his normal rate, but by December it started showing that his knees, which have bothered him since college and were injured in April, were ailing due to lack of cartilage. He missed nine games before the Trail Blazers announced that he would be out indefinitely. It was widely speculated that Roy would not be able to play at an All-Star level again. This forced the team to start running its offense through forward LaMarcus Aldridge and backup guard Wesley Matthews. On January 17, 2011, Roy underwent arthroscopic surgery on both of his knees. He returned to the lineup on February 25, scoring 18 points off the bench, including a clutch three-pointer to force overtime, and helping the Blazers win the game 107-106. Roy then took on a reserve role for the rest of the season, scoring inconsistently to finish with a career-low season average of 12.2 points, 2.6 rebounds, 2.7 assists and 28 minutes in 47 games. 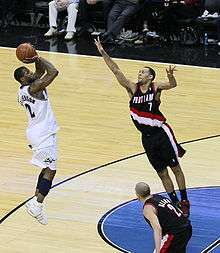 The Blazers then faced the Dallas Mavericks in the first round of the 2011 NBA Playoffs. Roy shot 1-for-8 the first 2 games, including a Game 2 where he saw only 8 minutes of playing time and went scoreless. The Blazers lost both games and trailed 0-2 in the series. He expressed his frustration about being the last substitution during the first 2 quarters, and playing for 8 minutes after getting 26 minutes in Game 1. The series then went to Portland, and Roy scored 16 points in 23 minutes off the bench to boost the Blazers to a 97-92 Game 3 win. Both the Blazers and Mavericks started Game 4 with a quiet first half, with Dallas leading slightly. The Blazers then missed their first 15 shots after halftime as the Mavs' lead grew as big as 67-44. Roy then made a three-pointer near the end of the third to cut the lead to 67-49. In the fourth quarter, Roy scored 18 points after going 1-for-3 the previous 3 quarters, including a clutch 4-point play to tie the game and a bank shot from the middle of the paint with 49 seconds left to give his team the lead for good, finishing with 24 points to lead the Blazers to an improbable 84-82 win to tie the series. The Blazers would go on to lose the series in 6 games, but it gave hope for Roy to start again next season. Just before NBA training camp opened following the resolution of the 2011 NBA lockout, Roy announced that his knees had degenerated so much—he lacked cartilage between the bones of both knees—that he was retiring from basketball. Following his announcement of retirement, the Portland Trail Blazers used their amnesty clause on Roy for salary cap flexibility. In June 2012, Roy announced that he was planning to make a comeback to the NBA. He said he had recovered enough to play after having the platelet-rich plasma procedure that Kobe Bryant has also had to keep his knees healthy. He could not play for Portland under the current NBA Collective Bargaining Agreement because of Portland's amnesty of him in 2011. Roy entered the free agent market on July 1, 2012. Roy reportedly had expressed interest in signing with the Dallas Mavericks, Golden State Warriors, Minnesota Timberwolves, Indiana Pacers, or Chicago Bulls. On July 31, 2012, Roy signed with the Minnesota Timberwolves. The deal put Roy with All-Star forward Kevin Love and point guard Ricky Rubio. He decided to wear No. 3, the number he wore during his college years at Washington. He felt well during training camp but suffered an injury after a collision during a preseason game on October 26, 2012. He played in five regular season games before needing season-ending surgery on his right knee. He averaged 5.8 points per game, 2.8 rebounds per game, and 4.6 assists per game in 24.4 minutes during the 2012–13 season. Roy was waived by Minnesota on May 10, 2013. Afterwards, he said, "Any time you walk away from the game, you have 'what-ifs'. I feel like I was able to answer those questions last year by going out there and giving it a try." Roy's longtime girlfriend Tiana Bardwell delivered their first child, Brandon Jr., whom they nicknamed BJ, on March 27, 2007, in Seattle. About two months later, Roy took Bardwell out to look at rings "just to get an idea of what she'd like". On June 16, 2007, while both were at Roy's home in Renton, Washington, he sent Bardwell a text message instructing her to look in a drawer in his closet, telling her that she could have whatever she found. Bardwell discovered a ring that she had mentioned she liked, at which point Roy entered the room with their son and said, "BJ wants to know if you will marry his daddy". Bardwell immediately accepted. Roy said the entire proposal was "free-styled". Roy and Bardwell had their second child, Mariah Leilani, in January 2009. Roy and Bardwell got married on September 4, 2010, in West Linn. 3x: NBA All Star: 2008, 2009, 2010. NBA All-Rookie Team: 2007 NBA All-Rookie First Team. Points: 52 on December 18, 2008, against the Phoenix Suns. Rebounds: 14 on February 21, 2008, against the Seattle SuperSonics. Assists: 12 on February 29, 2008, and April 4, 2009, against the Los Angeles Lakers. Blocks: 3 on March 3, 2010, against the Indiana Pacers. Steals: 10 on January 24, 2009, against the Washington Wizards. 1 2 "Brandon Roy Statistics". Basketball References. Retrieved November 8, 2008. ↑ "Brandon Roy". Retrieved December 3, 2008. ↑ "Broadcaster of the Week: Brian Wheeler, Trail Blazers". NBA.com. 1 2 "Blazers' Brandon Roy to retire". ESPN.com. December 10, 2011. Retrieved December 12, 2011. 1 2 Meagher, Sean (December 10, 2011). "Trail Blazers: Brandon Roy issues statement on his retirement: 'It was a great ride'". The Oregonian. Retrieved December 12, 2011. ↑ "Brandon Roy". USA Today. June 16, 2012. Retrieved July 1, 2012. 1 2 "NBA.com – Trail Blazers' Brandon Roy". NBA.com. Retrieved November 16, 2008. ↑ "Two Hometown Hornets Named as Reserves for 2008 NBA All-Star Game". NBA. Retrieved May 17, 2010. ↑ "Roy makes second straight All-Star team". OregonLive.com. January 29, 2009. 1 2 MacMahon, Tim (January 28, 2010). "All-Star homecoming for Bosh, Williams". ESPN.com. Retrieved January 28, 2010. ↑ "Roy represents Blazers with big game". OregonLive.com. February 15, 2009. ↑ "Roy's game does his talking", by Seth Prince, The Oregonian, April 15, 2008. 1 2 3 4 Hendrickson, Brian (December 9, 2007). "The Real Roy". The Columbian. Archived from the original on December 11, 2007. Retrieved March 10, 2008. ↑ "Player Bio: Brandon Roy". Archived from the original on November 5, 2008. Retrieved November 12, 2008. ↑ "Brandon Roy". InsideHoops.com. Retrieved May 15, 2007. 1 2 3 "BLAZERS: Brandon Roy timeline". Retrieved November 12, 2008. 1 2 "Prospect Profile – Brandon Roy". Retrieved May 15, 2007. ↑ "Roy scores career-high 35 in Huskies' Pac-10 opener". ESPN. December 29, 2005. Retrieved December 29, 2005. ↑ "No. 7 UW upset, nation's longest home streak ends". ESPN. December 31, 2005. Retrieved December 31, 2005. ↑ "UW Huskies Have Sweet 16 Matchup With UConn Huskies". Retrieved May 15, 2007. ↑ "Trail Blazers Land Brandon Roy and LaMarcus Aldridge". Retrieved May 15, 2007. ↑ "Roy's number to be retired tomorrow at game against USC". Retrieved January 21, 2009. ↑ "Brandon Roy Yahoo Player Profile". 2006-06-19. ↑ Kelly, Steve (October 11, 2006). "Roy is just the player to help the Blazers make a turnaround". The Seattle Times. Retrieved November 12, 2008. 1 2 3 4 5 6 "Roy receives 127 of 128 first-place votes as top rookie". espn.com. Associated Press. May 2, 2007. ↑ "Guard Brandon Roy makes rookie-sophomore game at All-Star event". espn.com. Associated Press. January 31, 2007. ↑ Freeman, Joe (February 25, 2008). "Roy could miss L.A. trip". The Oregonian. ↑ Arnold, Geoffrey C. (February 16, 2008). "Roy crashes a party". The Oregonian. ↑ "2008 NBA All-Star Boxscore". February 17, 2008. Retrieved March 7, 2007. ↑ "Report: Brandon Roy Will Be Ready for Opening Day". August 14, 2008. Retrieved August 15, 2008. ↑ "Roy's Buzzer-Beater Lifts Blazers Past Yao, Rockets in OT". Retrieved November 9, 2008. ↑ "Blazers end 11-game skid vs. Phoenix behind Roy's career-high 52". ESPN. December 18, 2008. Retrieved December 20, 2008. ↑ "Roy swipes 10 steals, Oden continues encouraging play in Blazers' win". ESPN. January 24, 2009. Retrieved January 25, 2009. ↑ "Roy's layup at buzzer gives Blazers win vs. Knicks". NBA.com. February 8, 2009. Retrieved February 8, 2009. ↑ "Brandon Roy Is Pretty Good". April 13, 2009. ↑ "NBA.com: James outdistances Bryant in winning Kia MVP award". May 4, 2009. ↑ "Brandon Roy Earns All-NBA Second Team Honors". NBA. Retrieved May 17, 2010. ↑ "Roy agrees to extension with Blazers". ESPN. August 6, 2009. Retrieved September 13, 2009. ↑ "Roy to miss postseason". ESPN.com. Associated Press. Retrieved April 15, 2010. ↑ John Hollinger. "Roy returns for Trail Blazers". ESPN.com. Retrieved April 24, 2010. ↑ "Best on offense (Durant), defense (Howard) pace All-NBA team". NBA. Retrieved May 17, 2010. ↑ UPI.com. "Brandon Roy out indefinitely". UPI.com. Retrieved October 23, 2011. ↑ "Brandon Roy has surgery on both knees". Associated Press. Retrieved October 23, 2011. ↑ "Blazers beat 'Melo-less Nuggets in overtime". USA Today. Associated Press. February 26, 2011. Retrieved October 23, 2011. ↑ SportsDayDFW.com. "Turmoil for Blazers? Brandon Roy fights off tears, complains about playing time vs. Mavericks". SportsDayDFW.com. Retrieved October 23, 2011. ↑ Jeff Caplan. "Mavericks can't find answer for Roy". ESPN. Retrieved October 23, 2011. ↑ "Trail Blazers Designate Roy Contract for Amnesty". NBA.com. Turner Sports Interactive, Inc. December 15, 2011. Retrieved December 16, 2011. ↑ "Wolves introduce Brandon Roy". ESPN. July 31, 2012. Retrieved July 31, 2012. ↑ Bresnahan, Mike; Turner, Broderick (June 30, 2011). "Kobe Bryant undergoes a different kind of knee procedure". Los Angeles Times. Retrieved July 31, 2012. ↑ "Report: Brandon Roy narrows free-agent list to five teams". SI.com. July 1, 2012. Retrieved July 31, 2012. ↑ "Wolves Sign 3-Time NBA All-Star Brandon Roy". NBA.com. Turner Sports Interactive, Inc. July 31, 2012. Retrieved July 31, 2012. ↑ "Brandon Roy out at least a month". ESPN. November 19, 2012. Retrieved November 21, 2012. ↑ "Wolves Waive Brandon Roy". NBA.com. Turner Sports Interactive, Inc. May 10, 2013. Retrieved May 10, 2013. ↑ Kevin Pelton (June 24, 2013). "Brandon Roy calls it a career". ESPN. Retrieved August 3, 2013. ↑ "LaMarcus has a big March; Roy is a new daddy". Associated Press. March 29, 2007. Archived from the original on September 27, 2007. Retrieved May 15, 2007. ↑ Quick, Jason (July 27, 2008). "Part I – Roy's marriage proposal: Little BJ gets an assist". The Oregonian. Retrieved November 9, 2008. ↑ "The Blazers have entrusted their future to a 24-year-old". Sports Illustrated. February 9, 2009. Retrieved March 9, 2009. ↑ "Trail Blazers' Brandon Roy gets married". OregonLive.com. September 29, 2010. Retrieved December 26, 2010. ↑ "Players of the Week: Devin Harris, Brandon Roy". NBA.com. December 1, 2008. Retrieved May 15, 2009. ↑ "Bulls' Gordon, Blazers' Roy named Players of the Week". NBA.com. April 17, 2009. Archived from the original on April 29, 2009. Retrieved May 15, 2009. ↑ "Players of the Week: Andrew Bogut, Brandon Roy". NBA.com. March 15, 2010. Retrieved March 15, 2010.
www.broy7.com Brandon Roy's official website, broy7.com/ Retrieved December 25, 2010. Tim Davenport, "Brandon Roy: The Path to Portland," blazersedge.com/ December 25, 2010. Ben Golliver, "Brandon Roy Could Cook," blazersedge.com/ December 15, 2011.